Terry Hancock took this image of NGC 5907, also known as the Knife Edge Galaxy or the Splinter Galaxy, from Down Under Observatory in Fremont, Mich. after 7.2 hours of exposure time over four clear nights in May, 2013. The Knife Edge Galaxy slices through deep space in this spectacular night sky photo. Astrophotographer Terry Hancock took this stunning shot from Down Under Observatory in Fremont, Mich. after 7.2 hours of exposure time over four clear nights in May 2013. 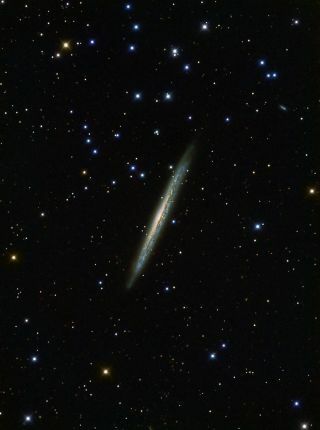 The Knife Edge Galaxy, or NGC 5907, is located in the constellation of Draco about 50 million light-years from Earth. The edge-on spiral galaxy has arcing loops of debris surrounding it that look like a halo in the sky. Its unique shape has also earned it the nickname Splinter Galaxy. To capture the image, Hancock used a QHY9M monochrome CCD camera, StarlightXpress Color Filter Wheel, Astronomy Technologies Astro-Tech 12" f/8 Ritchey-Chrétien astrograph optics, Paramount GT-1100S German Equatorial Mount (with MKS 4000), and image acquisition software Maxim DL5.